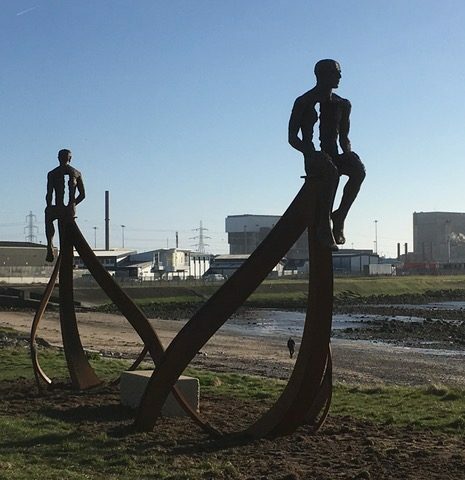 A new large-scale public sculpture by ACS member Anna Gillespie has been unveiled in Heysham, Lancashire. Reflecting on the maritime heritage of Morecambe Bay and its surrounding landscape, the new bronze and steel sculpture has been installed at Half Moon Bay, in sight of Heysham Port, by the coast. ‘Ship’ features two figures sitting on the bow and stern of a Viking-style longboat, symbolically positioned on the boundary between land and sea. One figure looks towards ‘the new’ of Heysham Nuclear Power Station and the other faces ‘the old’ of St Patrick’s Chapel, an ancient monument considered to be one of the oldest religious buildings in the North West. The piece was commissioned by the Morecambe Bay Partership, the latest in a series of artwork and cultural event commissions in the ‘Headlands to Headspace’ project, and received financial support from the National Lottery Heritage Fund.